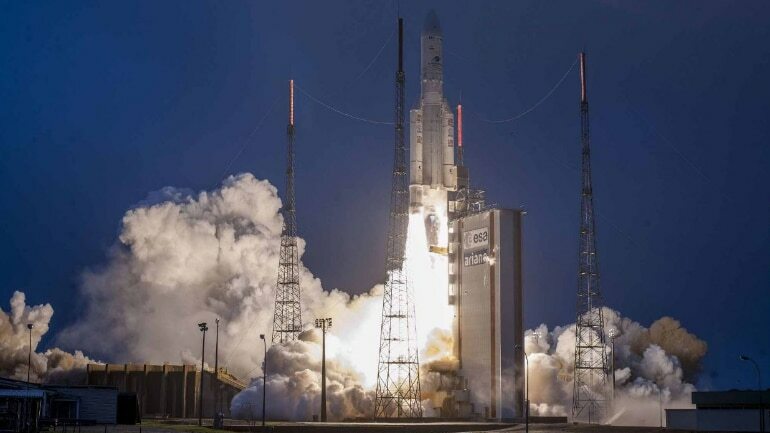 SRO launched India’s 40th communication satellite, GSAT-31, onboard European launch services provider Arianespace launch vehicle, this morning, from French Guiana. The satellite was placed into the orbit within 42 minutes of its launch from Ariane Launch Complex at Kourou, a French territory located in the northeastern coast of South America, at 02:31 am (IST). The satellite, GSAT-31, derives its heritage from ISRO’s earlier INSAT/GSAT satellite series, the space agency said, adding that it provides Indian mainland and island coverage. “It gives me great pleasure on the successful launch of GSAT-31 spacecraft onboard Ariane-5, this is the third mission for ISRO in 2019,” ISRO Satish Dhawan Space Centre (SDSC) Director S Pandian said soon after the launch. 1. With a mission life of around 15 years, GSAT-31 will be used for supporting VSAT networks, television uplinks, digital satellite news gathering, DTH-television services, cellular backhaul connectivity, and many such applications. 2. It will also provide wide beam coverage to facilitate communication over a large oceanic region, comprising large parts of Arabian Sea, Bay of Bengal and the Indian Ocean, using a wide band transponder. 3. According to ISRO, two Ku-band beacon downlink signals are transmitted for ground tracking purpose. GSAT-30 is another geostationary satellite to be lofted soon by Arianespace. Since the launch of India’s APPLE experimental satellite on Ariane Flight L03 in 1981, Arianespace has orbited 22 satellites and signed 24 launch contracts with the Indian space agency. Apple’s new iPhone SE arrives in stores today in key Asian markets, though it will be early April before it arrives in Ireland. The smaller, lower-priced phone is aimed at emerging markets, though initial sales will be in only one of the 12 markets which could be considered emerging, and that’s China. It’ll take another two months for the device to hit the next 100 countries, according to Apple. In recent years, China has regularly been included in the first wave of product releases. That’s helped Apple ensure solid initial demand, which is critical to those fanfare statements about record opening-weekend sales. As for pricing, China will again pay a premium to the US cost for Apple devices. The SE features a four-inch screen, comes in four stainless- steel finishes, and incorporates the faster A9 processor that also runs the larger iPhone 6S handsets. It has full support for the Siri voice-enabled digital assistant, a 12-megapixel camera, and includes features found on the larger phones like Apple Pay and the more secure Touch ID fingerprint scanner. 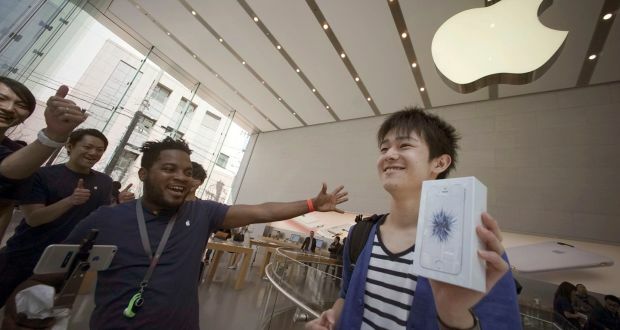 The revamped compact iPhone arrives two months after Apple said quarterly sales will probably decline for the first time since 2003, heightening concern that demand for high-end smartphones has reached its peak. Apple is betting a new 4-inch iPhone will spur smartphone users in key markets such as China and India to ditch their larger-screens in favour of the diminutive, yet feature-rich and lower-priced iPhone SE. The plan, if successful, will pose a challenge to its Asian competitors such as Huawei Technologies and Xiaomi which have been churning out big-screen phones to win market share in the crowded mid-range and near-premium segments. “With the iPhone SE, Apple is choosing to aim at an under-served segment of consumers that prefer small screen smartphones and have been reluctant to upgrade,” research firm IHS said in a note. “Importantly, Apple’s competitors have chosen not to target the premium compact smartphone market.” Users will be more willing to ditch their larger screens if Apple’s smaller phone can match-up in features, analysts said. Apple celebrates its 40th birthday on Friday having risen from a three-man project in a California garage to the most valuable company in the world, estimated to be worth more than $700 billion. Founders Steve Jobs, Steve Wozniak and Ronald Wayne created the company on April 1st 1976 as they set about selling computer kits to hobbyists, each of which was hand-built by Mr Wozniak. In contrast, today the company has more than 480 retail stores in 18 countries worldwide and reported income of more than $18 billion for the first quarter of this year. The company also recently revealed that there are now more than one billion active Apple devices being used around the world. Chief executive Tim Cook described the figure as one “no-one could have imagined”, adding that it was an “indicator of how much impact Apple has on people around the world”. The company’s journey to the summit of the technology industry has been a rocky one, having seen Mr Jobs leave the firm in the mid-1980s after his pet project, the first Macintosh computer, struggled and he attempted to oust then chief executive John Sculley. Apple’s place as an industry leader, before his death from cancer in 2011. Since then the firm has also launched its first wearable, the Apple Watch, and continued to see an increase in sales in its MacBook line of computers despite a global drop in PC sales. The Apple Music streaming service was also launched in 2015, gaining more than 10 million paying users since then. However, Apple has also recently been at the centre of a battle with the US government and intelligence agencies over data encryption, with the technology firm refusing to help the FBI unlock an iPhone belonging to a terror suspect, claiming it violated user privacy and the process would make all iPhones more vulnerable. The firm received backing from the wider tech community before the FBI gained third party help to access the phone and ended court proceedings. The company’s 40th birthday was being marked by the launch of the iPhone SE and new smaller iPad Pro on Thursday, with the smartphone believed to be aimed at emerging markets such as China and India, not traditional targets for Apple, as the next phase of the firm’s history begins.